If you can believe it, it’s already about time to celebrate Easter! It’s certainly a holiday to be with family, and that includes our dogs, of course. Easter baskets and bunnies may be mostly for human kids, but your dog doesn’t have to miss out on all the festivities. An egg hunt is a great way for your dog to use their nose, get some exercise, and enjoy the spring weather! Hopefully the videos below will inspire you to have your very own doggy Easter egg hunt. Not only is it a great way to get your dogs involved in the holiday, it also makes for an extremely adorable video and photo opp. Just remember to supervise the hunt and take away any plastic eggs before your dog can chew on them or swallow them. This is about fun, and a sudden trip to the vet isn’t fun for anyone. 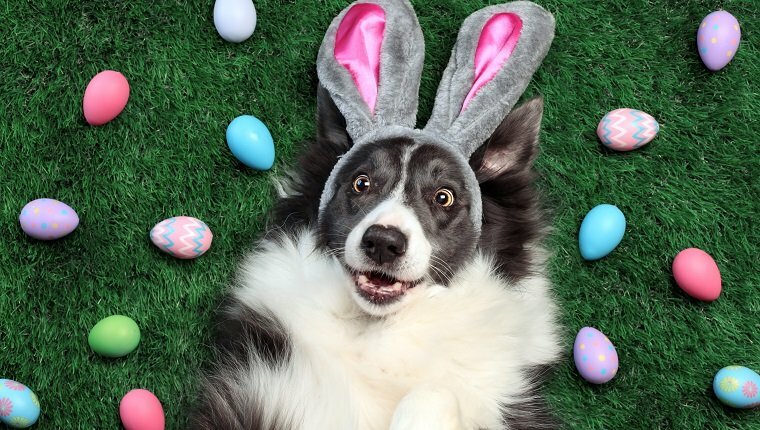 To help you get into the Easter spirit, check out these nine videos of dogs having their very own egg hunts! There is no doubt about it, Petee is excited about this holiday. Petee’s owner already knows this, so she set up his very own personal Easter egg hunt. Before Petee is even let outside he knows exactly what’s about to happen and cannot contain himself, barking and wagging his tail. He is one very smart dog because he’s able to find all the treats that she hid for him. From the looks of it, Petee definitely had a great Easter. This owner got creative and stuffed some plastic eggs with dog food. She then hid the eggs around the living room, putting them under the couch and even in Easter-themed stuffed animals. Not only do the dogs get to join in on the fun, but they also get some mental stimulation as they think about how to get the treats out of the eggs. This video features a Bernese Mountain Dog, a Samoyed, and an Irish Setter mix all having a blast! A sweet kitty also makes an appearance! Watch out because here comes the pack! These Siberian Huskies come running out of the house ready to put their dog noses to the test. Even though their owner hides the eggs in some pretty sneaky places, it doesn’t seem to stop their noses. In true Easter spirit, the dogs never fight with each other over the eggs they find–showing just how friendly of a pack they truly are! Koby is an Easter egg Einstein! With lots of positive reinforcement training, Koby the puppy has learned to not only find the Easter Eggs, but bring them back to his owner and place them inside the Easter Egg basket! He doesn’t just find the eggs, but actually puts them in the basket exactly as a person would do. This genius–and adorable–Easter doggo definitely deserves a round of applause. This video features probably two of the happiest Labrador Retrievers you will ever see. It starts off with an adorable picture of the dogs dressed up with bunny ears sitting in front of a basket, showing just how ready these pups are for the holiday. From the moment their owner says “Do you want to do your Easter egg hunt,” these two dogs do not stop wagging their tails for one second. You can tell they had a great time because, by the end, they are two very sleepy pups. Lacy is the most professional Easter egg finder around. If this were a competition, she would undoubtedly win. Not only does she start looking when she is commanded to, but when she finds the eggs, she immediately looks to her owner to let her know. She paws at her and directly brings the egg to her. Even the most hidden eggs are not a problem for her nose. Lacy makes it look way too easy. If she weren’t busy Easter egg hunting, there is no doubt that Lacy would make a great search and rescue dog! Jaspar isn’t your ordinary dog. Most dogs specialize in making messes and not cleaning them up–that’s our job as humans, right? Well, Jaspar would disagree. In fact, Jaspar actually helps clean up after play time, something we all wish our dogs would do. After completing his Easter egg hunt and finding all the treats, Jaspar sticks around and helps pick up the plastic eggs. You might wish your dog was as neat as Jaspar! Prepare yourself for an eggs-tremely intense Easter egg party. After laying out all the eggs, the owner lets all nine dogs–yes nine–come into the room. Opening the door is like releasing the flood gates. The dogs run into the room in a chaos of motion because nothing will keep them from their treats. See for yourself the amazing dog party that follows. Nothing says adorable like puppies hunting for Easter eggs. If you or someone you know is having a down day, watch this video because it will make you feel a lot better. These Golden Retriever puppies are the epitome of cute trying to get their treats out of the eggs. Since they’re only puppies, they need a little human assistance. But in the end, these sweet puppies succeed! How do you celebrate Easter with your dogs? Have you ever had a doggy Easter egg hunt? Let us know and leave a comment below!